I stood there in a daze….amazed. Then I recalled the boat trip I had taken with my husband and dogs in 2009, and how we had seen the blue-green algae clearly along the edges of the locks while going into the lake and I had videotaped it. I am including a photo I took of that video below. When Senator Rubio visited Stuart on behalf of the SLR/IRL (St. Lucie River/Indian River Lagoon), I told this story….I have told it many times at many official meetings to no avail. I think it is a significant issue. So far this year, with the releases from our local canals, toxic algae, or Cyanobacteria, has not been reported in the SLR/IRL. It could be in the future, but it is less likely than when the ACOE is releasing from the lake. Why? Because often when they release from the lake it is TREMENDOUS amounts of freshwater, even more than comes from our local canals. 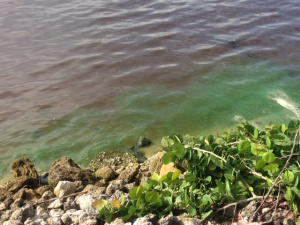 Plus the blue-green algae is already in the lake as its freshwater. According to Bob Washam, blue-green algae was first reported around 1995 and it was blue! They thought it was a paint spill. The outbreaks have been more common since this time the worst being in 1998. Whether blue or green in color, it is bright. Very bright. You can see it. How could our government, in essence, “poison its own people,” and how can we allow this, especially when we can see it? We must push our government for change. Health, safety and welfare are something we rightfully deserve. Send the water south where it naturally belongs. About the author, Jacqui Thurlow-Lippisch, has been a defender of river health in the St Lucie River/Indian River Lagoon for many years and is a member “Rivers Coalition Defense Fund”. The Defense Fund helps promote the health and ecological balance of the St. Lucie River Estuary and Indian River Lagoon. The above information is opinion based except where noted. HealthyMartin.com is designed to assist you in finding medical doctors, dentist and alternative, organic & holistic health professionals in the Treasure Coast Florida areas of Martin County, Palm Beach County, Saint Lucie County and Indian River County. “Healthy Martin, working together for health choices for you, your family and friends”.